Dvorah sounds exotic, but this name is cousin to a former Top Ten favorite. Thanks to Kaeli for suggesting our Baby Name of the Day. Debbie is a Baby Boomer, a snack cake spokesperson. In the Old Testament, Deborah is a hero, leading the Israelites to victory over the Canaanites. 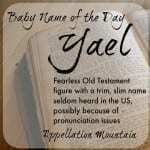 The name’s meaning is usually given as bee, but any Biblical name is likely to have multiple interpretations. It’s yet another name that caught on outside of Jewish families only after the Protestant Reformation. So what’s with the funky Dv spelling? Remember that English doesn’t use the same alphabet as Hebrew, and there’s room for variation and interpretation when translating – or transliterating – between two alphabets. 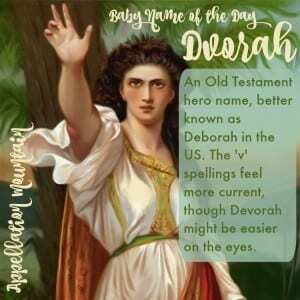 So Deborah is sometimes written as Devorah and Dvorah and Dvora, too. 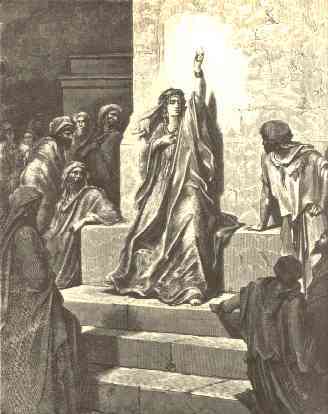 Dvorah was already a respected leader – a prophet – in Israel when she made her stand, leading Israel to overthrow Canaanite rule. s done in by Yael, in another gory story. 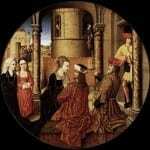 A song of praise is sung in the Book of Judges, and Dvorah is often referred to as “mother of Israel” for her leadership. While Deborah has lost some of that luster – we just know too many Debbies! – all of the Dv- and Dev- spellings connect the name to its Old Testament roots. Dvora was used sparingly between the 1950s and 1970s, corresponding to the peak years for Deborah. Dvorah is almost entirely unused in the US. Devora has among the longest histories of use, and was given to 66 girls in 2013 and 63 girls in 2014 – suggesting that the name may be on the upswing. Devorah is currently the most popular form of them all, given to 126 girls in 2013 and 105 girls in 2014. That’s far from a hit, but it’s enough to suggest that there’s interest in this name. There’s a settlement named in honor of the heroine in northern Israel. Devorah Baron is often called the first Modern Hebrew woman writer. She was educated – unusual for the time – and published her first works in 1902, when she was just fourteen years old. Later in life, she’d also become a translator. Dvora Omer was a well-known Israeli novelist in the twentieth century. Devorah Bertonov was a famous dancer, awarded the Israel Prize in 1991 for excellence in her field. File this one with Shoshannah and Rivka. While the name has seen some use elsewhere in the world, if I met a Dvorah, I would guess that she had roots in Israel, or at least came from a Jewish family. And yet I’m not sure it has to be exclusive to families of Jewish heritage. Deborah, after all, has long since become mainstream for families of many different faith traditions. The Dv- spellings are authentic, and yet they lack a certain phonetic transparency. Kveller lists Devorah and Devora, along with with Devra. I do think those might be the most wearable of the possibilities in American English today. And I do think it’s wearable – an ancient spin on an enduring name. What do you think of Dvorah? How would you spell it? I was given the name Dvorah (and when people ask me how to say it I tell them to say this combo deliciously voracious – and then break it down to deh-vore-ahhh.. I have a lot of japanese friends so I use some hiragana in the mix でVOREら). Aww, I can’t believe I missed this post! Thanks so much for posting it, Abby. I personally am in love with Dvora. My husband and I visited Israel a couple years ago and absolutely loved it there. I was most fascinated to hear how our guide authentically pronounced Jewish names. They were often much different from how I grew up hearing them at church (very anglicized versions, obviously). He pronounced Deborah like De-VOR-uh, and I instantly thought, Wow! That’s a huge improvement on the name! Then I was watching a tv show and there was a minor character names Dvora. I didn’t even link it to Deborah at first, it sounded so fresh. I love it! My littlest—Djuna—’s Hebrew name is Devorah Dorit and I looooove saying it. It’s easily my favorite of all my kids’ Hebrew names. We generally honor someone departed with the Hebrew name, and she’s named for the mass die-off of my honeybee hives the fall I was pregnant with her, as Devorah is bee in Hebrew. And incidentally, I know just one Russian Dvora but several Devora(h)s! LOVE everything about your daughter’s name! Was there pressure to honor a family member with her Hebrew name? I think your choice is very appropriate, but I’ve never heard of anything quite like that. Nah, my family knows better. 😉 It helps that we’re secular. 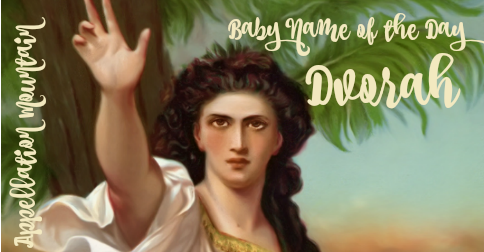 Just curious how you pronounce Devorah? And would you think there’d be any pronunciation issues here in the US for non Jews? Thanks so much! Resident Jew chiming in! I know Devras and Devora(h)s, though I don’t think I’ve met anyone with a Dv spelling. Responding to emmy, I don’t think I’d be offended if a non-Jew used a version of the name (it’s definitely not a Cohen! ), though I’d definitely be very surprised. It’s most used by more religious families — all of the Devorahs I know went to Jewish private schools, for instance. But as a namesake for Deborah, Jewish or not, I like it! In fact, that seems to me a good enough explanation for using it, that could negate some of the appropriation concerns. I’ve loved this name since the first time I saw it. It’s beautiful, and my mother’s name is Deborah. I’d love to use an honor name for her that avoided the still-very-fifties sound of Deborah and, more importantly, the nickname “Debbie,” which neither of us like. But I’ve always worried that it would be strange bordering on culturally appropriative to use a name that’s still so strongly rooted in Hebrew and in Israeli culture, especially one that has an Anglicized equivalent in mainstream use, without any Jewish heritage. I can’t tell if that’s just me or if many people would have that reaction. I’d hate to give a child the burden of a name that winds up offending others. If I didn’t think this was a potential issue, this name would probably be on my top three list. It’s just so pretty, and the original Devorah was such an amazing figure. Also a Jew, also wouldn’t be offended! I’d assume she was Jewish, but wouldn’t be aghast to find out she wasn’t. It’s just so close to Deborah that it seems inevitable that Deborah’s kids would find and use it.